Students support a fair deal! 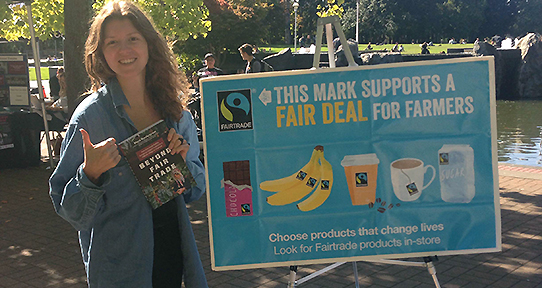 UVic supports fair trade purchasing in several ways. We stock Fairtrade products in all our food outlets across campus, including the Student Union Building (SUB), Grad House (under renovation) and Finnerty Express cafe / Bookstore. UVic also has student run clubs for you to get involved in, and offers academic courses that focus on food systems and sustainability. There is also a fair trade steering committee. Vending machines - coming soon to a machine near you! If you want to get more involved in the Fairtrade movement, let UVic show you how! There are many club and courses on campus that have a central theme of sustainability and food ethics. Beyond UVic, volunteering at local organizations in the community is one of the most enriching ways to learn. UVic has a Fair trade Steering Committee that focuses on increasing the availability and number of Fairtrade products on campus, and creating awareness and education opportunities regarding Fairtrade. The committee comprises of representatives from Campus Planning and Sustainability, UVic Food Services, UVSS, GSS, Campus Services, and faculty. Of the membership, there is representation from the undergraduate and graduate student body. Follow us @green_uvic for more updates.